Bedfordshire is the location of a number of notable UK and international companies who have either headquarters or major bases in the county. Autoglass, Boxclever and Charles Wells Pubs are all based in Bedford, while the Kier Group and Kingspan Timber Solutions are based in Sandy, and Jordans Cereals are based in Biggleswade. EasyJet, Impellam, Monarch Airlines, Thomson Airways and Vauxhall Motors are all based in Luton, while Whitbread (including Costa Coffee) is based in nearby Houghton Regis. UltraVision is based in Leighton Buzzard, while Moto Hospitality is based at Toddington service station. 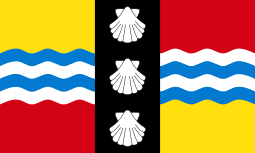 After the 2009 structural changes to local government in England, Bedfordshire County Council was abolished, and its responsibilities for education were passed to Bedford Borough Council and Central Bedfordshire Council. 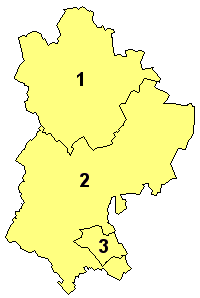 Though Central Bedfordshire plans to continue with the three-tier model in its area, Bedford Borough Council voted in November 2009 to change to the two-tier model in its area. The change was due to be introduced over a five-year period and be completed in 2015. However, with the cancellation of the Building Schools for the Future programme in 2010, the borough has changed its proposals, and the switch is now proceeding on school by school basis where council funds allow. ↑ "The Bedfordshire (Structural Changes) Order 2008 (S.I 2008 No. 907)". Office of Public Sector Information. 27 March 2008. Archived from the original on 2 May 2009. Retrieved 2009-03-27. ↑ "Bedford Borough and Central Bedfordshire and Libraries - About Your Library - Bedfordshire's Virtual Library". Galaxy.bedfordshire.gov.uk. Retrieved 2010-09-25. ↑ "The Local Government (Structural Changes) (Areas and Membership of Public Bodies in Bedfordshire and Cheshire) Order 2009 (S.I 2009 No. 119)". Office of Public Sector Information. 28 January 2009. Retrieved 2009-03-27. ↑ "The Parliamentary Constituencies (England) Order 1995". Office of Public Sector Information. 1995. Retrieved 2009-03-31. ↑ "The Parliamentary Constituencies (England) Order 2007". Office of Public Sector Information. 2007. Retrieved 2009-03-31. ↑ "Bedford & Milton Keynes Waterway Trust". B-mkwaterway.co.uk. Retrieved 2010-09-25. ↑ "Two-tier school proposal rejected". BBC News. 2006-07-13. Retrieved 2008-02-10. ↑ "Middle schools to be abolished - Biggleswade News". Bedford Today. Retrieved 2010-09-25. ↑ "'Momentous decision' for schools". BBC News. 2009-11-17. Retrieved 2010-04-26. ↑ "Tiers to be shed in school restructure? - Local". Bedford Today. Retrieved 2010-09-25. ↑ "Education in Bedford". Bedford Borough Council. 2004. Archived from the original on 18 March 2009. Retrieved 2009-03-31. ↑ "Education and Schools Information" (PDF). Creating Central Bedfordshire. Central Bedfordshire Council. Retrieved 2009-03-31. ↑ "About Millbrook Group". Millbrook Proving Ground. Retrieved 30 August 2016.